We were sad to hear the news that Geoff Dorset BHSI passed away on 7 May, aged 93 years. Geoff was a BHS Assessor and Chief Examiner for many years. He was one of life’s gentlemen and would always ‘doff’ his cap when greeting you with a big beaming smile. 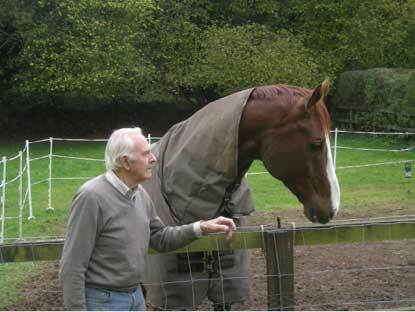 He was respected by all who knew him and his quiet, gentle approach with horses won him many friends and admirers. Geoff was a remount trainer with the Metropolitan Police Mounted Branch and his quiet leadership led to the worldwide reputation that Imber Court had as the ‘gold standard’ in mounted police training. He will be sorely missed by all who knew him. On Monday 8th May, 11 members of the F and I association and friends spent a very fruitful day with Judy Harvey. The morning session was filled with an eclectic mix of five horses, working at different levels, ranging from retired racehorses to a very game grey cob. These were followed by 3 superstar horses ridden by Judy’s working pupils and a client. Judy’s insightful observations and suggestions were ‘to the point’ and resulted in improvements with all the horse/rider combinations. The common thread was the need to ‘wait with energy’ in the paces and movements and allow the horse time to find its balance. Much emphasis was placed on working on the problems that arose, quietly and with empathy, through understanding the strengths and weakness of the horse. It was a pleasure to see all the horses quietly grow and improve, even if they had to work through ‘difficult’ patches. This was achieved by very astute and clear direction from Judy and sympathetic riding by all the riders. There was also much input and banter from the ringside gallery. The ‘Gold Star’ was awarded to Sally the grey cob and ridden by Ann Bostock for the best flying changes of the day. A big thank you to Judy for welcoming us to her yard for the day and filling the day with knowledge and understanding. And a big thank you to Ann for organising the day. This year at Badminton the BHS Fellows and Instructors Association were treated to a course walk with Eric Smiley FBHS. Born and raised in Ireland, Eric spent 10 years in the cavalry Regiment then decided to pursue a Professional career with horses. Having trained at Talland to gain his BHSI he then returned to Ireland. He gained his Fellowship in 1995 and now lives in Dorset with his wife Sue. Eric gained his first team selection in 1985 for the European Championships at Burghley. Since then, he has represented Ireland at two European Championships, three World Equestrian Games and been on four Olympic Teams competing at Barcelona and Atlanta as well as a regular competitor at Badminton and Burghley. To begin the walk Eric asked everyone to imagine which horse they had brought with them to ride around Badminton – to think of its strengths and weaknesses and to keep those in mind when approaching each fence. He stressed that the rider’s main responsibilities would be pace and line throughout. Eric thinks that there are three types of rider who arrive at Badminton, those who are just happy to be there, those who are determined to get round clear and those who are there to win! He explained that each of these groups would have a different plan of attack for cross country day. As the walk progressed it was clear that Eric Smiley was determined to make this a learning experience for all, asking questions and getting observers to analyse each fence for their particular horse. The first fence the group looked at was fence three, the Keepers Question, a large table with a gaping hole underneath. We were asked to imagine the fence with a solid front. He advised that the dimensions were perfectly acceptable at this level and the hole was just there to let the riders know that the designer Eric Winter meant business! As we approached fence four, Mike Weavers Haywain, Eric drew attention to the undulating ground which would help the horse to balance itself before the fence, also the steep rise and the ledge would help the horse to come to a good take off spot. He discussed making the time at 4* level and at this fence the rider should not be needing to balance the horse a long way before the fence, thus losing valuable seconds. Fence five, Savills staircase was the first combination – the old Beaufort Staircase. There was a choice of a left or right hand rail in, steps down to a skinny angled brush. Eric emphasised the importance of not allowing a horse to deviate from a line and asked us to imagine how we would apply that to our horse. He stressed the importance of not panicking at the A element of combinations because a line would open up in front of the rider and to concentrate on jumping in over the A element well. Fence six was a new fence, the Countryside birch, with a clever design. Essentially an enormous table made more difficult because of clever course stringing and its position in relation to a large tree on the landing side. At this stage the riders different approaches to the course will become apparent, are they there to get round or to win? Eric talked about Eric Winter’s subtle use of line throughout the course which will force the rider to think about their options very carefully every step of the way and that this would make this a mentally taxing course for the rider. Fence seven and eight the L200s and The Lake are early in the course this year. Eric explained that the complex scene which opens up in front of the fence can be distracting for the horse, taking its focus away from the obstacle in front of it. It was important to find a good purposeful take off spot for the pickups. The log into the water he thought should not cause problems, riders should keep the horse’s focus up on the log and not down through the gap. How the rider chose to ride the exit would depend on the horse they are riding, the narrow brushes are angled left or right, and the decision would depend on the horse’s strengths, the right hand brush is slightly faster. Eric explained that the offset oxer at fence nine is clever use of an optical illusion. The narrower from side to side that a wide fence is, the higher and more daunting it appears. At the Shogun Hollow fence ten, the route chosen would depend on whether your horse jumps right or left hand corners better. Clever use of fence dressing makes the approach to the second corner on the fast route challenging; the trick here would be not to disturb the horse’s rhythm going through the hollow. At KBIS eleven and twelve, the first crossing of the vicarage ditch, Eric again emphasised the importance of line and suggested that riders who had had problems at ten may choose to jump the clever separately numbered alternative. There are two options at the Outlander bank 13ab. Selection of route would depend on your horses stride length and way of going. The approach canter needs to be punchy and uphill. The shorter distance on the right hand route would suit a more compact horse and has a more forgiving landing. The left hand route would suit a longer striding horse and would see the horse landing further down the bank. The Trakehner at 14 should not cause trouble at this level and was a great photo opportunity! The Hildon Water Pond at 15abc is clever use of terrain and line and comes in the middle of the most difficult section of the course from fence 8 – 20. At this point we may see horses start to lose confidence and riders adjust their plan accordingly and start to take alternative routes. Fence 16 is described as a let-up fence, but Eric stressed the importance of remaining focused throughout the course. Fence 17 the Mirage Pond. Eric took the group to the exit side of the pond and again explained the importance of not panicking when the line to the B element of a combination is not visible, in this case it was a ‘simple’ brush off a curving line. Fence 18 was a large oxer followed by the PHEV corral at 19ab. This fence was a new concept and interesting use of fence dressing to create a seemingly impossible line to the B element. Eric discussed the use of fence dressing as a distraction among a mass of rails and the challenge which the rider has to keep the horse focussed at this stage of the course. Fence 20 the Event mobility Dining Table is straightforward but followed by 21 which is a treble of maximum dimensions. An accuracy question at this stage of the course should not be underestimated. The distances are forward thinking and would require good attacking cross country riding. Fence 22 was a bull finch out of the far end of the Lake, not commonly seen these days. As a result of rider complaints, the brush had been thinned before the start of the competition. Despite it being unfamiliar Eric hoped that it would not cause many problems. Fence 23abc Huntsmans Close had been softened this year and involved a related distance of log piles. Whilst walking the course with riders Eric had stressed the importance of not being distracted by the position of the trees on take-off and landing but to focus instead on riding a curving line between the fences. By doing this the line would open up in front of the rider! At 24 the World Horse Welfare Gates, Eric again stressed positive riding of a curving line rather than sharp corners, so as not to break the horse’s rhythm thereby leading to an unfortunate mishap. There only remained the Quarry at 25 which involved more undulations and angles and a double of very large box hedges at 27 and 28. At this stage Eric stressed that they would need accurate riding as the horses would have weary legs and mistakes come all too easily. Eric concluded that you could see the influence of Eric Winter’s Showjumping background on his first Badminton Course. Eric Smiley did not think that this was a ‘normal’ Eric Winter course like Blenheim and that he had truly stepped up to the mark as a designer. Eric thought that a horse and rider combination would grow in stature if they successfully completed this track and he hoped that it would produce the kind of jumping that Eric Winter was looking for! All that was left was to thank Ann Bostock for organising, although she had to be elsewhere on the day and to thank Eric Smiley for his generous time.